Centrally located, very near to the main shopping area and old part. Good buffet breakfast and excellent restaurant. This hotel has a spa and business and conference centre consisting of 16 meeting rooms. 247 recently renovated rooms. 36 junior suites and 9 master suites. Excellent service. Located in the city centre. Minimalist decor and modern facilities with attention to detail. Professional service. The restaurant 'Aragonia Paradís' is one of the best in Zaragoza. 179 rooms of which 14 are junior suites and 10 master suites. The NH Gran Hotel in Zaragoza, opened in 1929 by Alfonso XIII, still feels like a hotel from this period, both elegant and classic. It offers luxurious surroundings together with excellent facilities. Its restaurant 'La Ontina' is one of the best for creative cuisine from the region. 115 habitaciones, 1 master suite and 18 junior-suites. This hotel was originally the Abacial palace set within what was once a Cistern Monastery. Both have been renovated carefully. A very reasonable restaurant. Peaceful location, fascinating rooms. 35 rooms, 4 junior suites and 1master suite. Set in a old-style Aragones building. The town which has been declared a Historical and Artistic centre, was once home to influential nobility and the 'Rey Católico' (Cathiolic king). A great place to explore the medieval part of the town and some very pretty places on the edge of the Pyrenees. Great views of the city. Traditional Aragones cuisine. Also see Paradores. 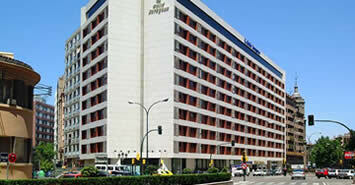 Look for the best hotel deals in Zaragoza. Check availability and book online. 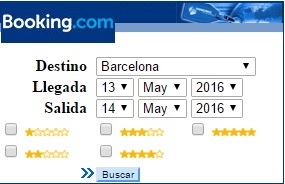 The results of your hotel search will appear in a new window (popup).